Yesterday some more “collaborationists” arrived from Manila. Among them were Justice Jorge Bocobo, Dean of the College of Law of the University of the Philippines; Mr. Arsenio Luz, Chairman of the Board of Information and Spokesman of Malacañan with the rank of Minister; Mr. Francisco Lavides, a Representative and lately Military Governor for the district comprising Laguna, Tayabas, Batangas and Mindoro; and Dr. Julio Luz. They brought much news and many newspapers. Some of the news are sensational. Wer were surprised to see Justice Bocobol he had never been a pro-Japanese, although he admires some of their virtues. He has always been sympathetic towards the Americans. He attributes his detention to the fact he was one of the signers of the first Manifesto and was a member of the first Council of State. The news about a resolution in the Senate referred to earlier has been cleared up. Sen. Ramon Torres presented a resolution providing for the immediate investigation of Senators Recto, Yulo, Paredes, Tirona, Madrigal, Sebastian and myself who are now under detention. He demanded the investigation to vindicate the good name of the Senate and in order to avoid difficulties that hamper the regular functioning of the Senate. He said that he is convinced that our detention is just the result of a misunderstanding, rather than to a real and just cause. He said that his purpose was to determine he qualification of the detained Senators to be members of the Senate. (Philippine Press, June 26, 1945). The Senators are being prevented from complying with their official duties for causes of which the Senate has no official cognizance. Torres asked: “Who of us who are free and fully enjoy our rights as Senators can say that we have a better right, rathen than better luck, than some of those presently detained?” The resolution gives authority to the Senate President to appoint a special committee of five senators. The Senate President is to make the necessary arrangements with the corresponding authorities so that the committee may be given the necessary facilities for the poper discharge of its functions. Post, June 24. The nature of the late President Quezon’s “last instructions” to ranking Filipino officials and members of his war cabinet –the crux of the collaborationist problem– was further clarified by Senate President Roxas. 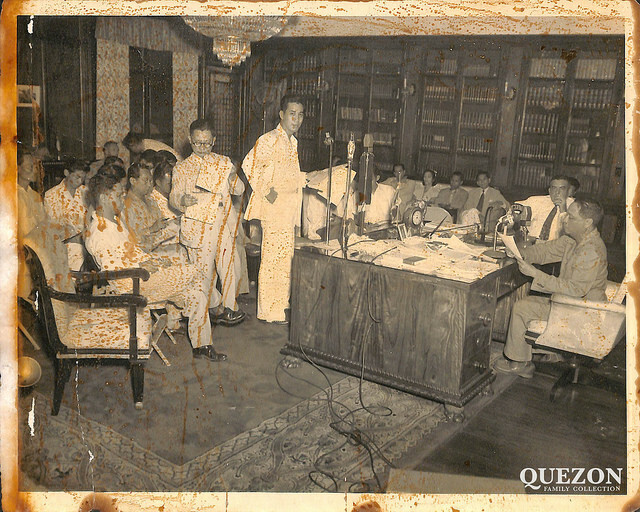 At a meeting held in Marikina, before Quezon went to Corregidor, Roxas recalled, the late President instructed those who were to remain behind to “remain at their posts and do their utmost to protect the people” while the nation waited for the arrival of the American forces that would redeem the Philippines’ freedom. Among present: Gen. Roxas, Secretary of Justice Jose Abad Santos, Secretary of National Defense Teofilo Sison, Secretary of Agriculture Rafael Alunan, Secretary of Finance Serafin Marabut, Exec. Sec. 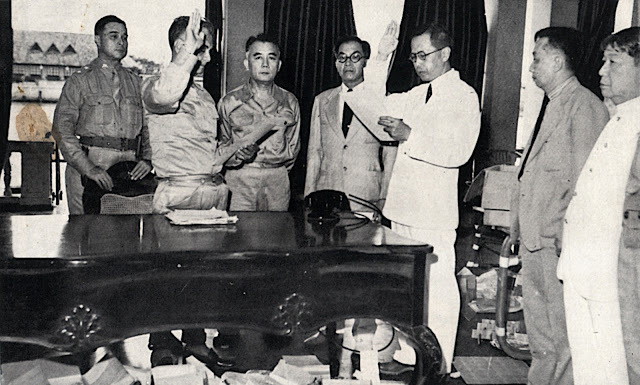 Jorge B. Vargas, Philippine Army Chief of Staff Basilio Valdes, and Dr. Jose P. Laurel, then Justice of the Supreme Court. News items on June 24, 1945: Senator Carlos P. Garcia yesterday (June 23, 1945) challenged his colleagues that they resign from the Senate and submit to a national election as early as feasible so that the voters will have a chance to render their verdict on “collaboration” and other issues that now threaten to split the Nacionalista ranks. Garcia took the floor to hit back at Senate Pres. Roxas who on Wednesday attacked him and Rep. Pedro Lopez of Cebu as well as the administration. All elective officials particularly those who held posts under the Japanese, should return their positions to the people because it is the latter who can decide who are the Filipino officials who did such acts as signing the Pact of Alliance, declaring war against the United States, and sending Constabulary with Japanese soldiers to mopping out operations in some provinces. They would wish to know whether Filipino leaders were really impotent to prevent these and other crimes, and if so wh they continued at their posts. He said those serving during Japanese occupation lost the confidence and trust of the people who have remained loyal to the Commonwealth and the United States. Pres. Osmeña is included in the request for resignation. Senator Garcia accepted Roxas’ challenge that he introduce a bill calling for an early election, but the date will have to be determined after complete order is restored. He said he is willing to have elections held as early as circumstances will permit. The above apparently is a rejoinder on the part of Senator Garcia. It was an answer to the speech of Roxas of June 21, 1945. My comment: I do not see that an election is necessary to find out the things Garcia said the people would like to know. We have been elected for a certain term under the Constitution and the people’s will should be respected. But under the circumstances, I cannot possibly refuse to resign. It may be interpreted as meaning that I want to hide something. I especially want the people to know that I have never been disloyal to my country. However, it occurs to me that the truth can very well be ascertained by following the constitutional processes. In the case of the senators, they cannot be not allowed to sit while an investigation is being held by a committee of the Senate and until their cases are decided by that body. Such measure as is proposed by Sen. Torres should be adopted immediately. We are entitled to perform the functions entrusted to us by the people if we are not guilty. Post, June 25, 1945. Roxas accepted the challenge made by Sen. Carlos Garcia, that the questions on which he (Roxas) and the administration differed be decided at an election. At 6 p.m. –sunset– the phone rang again. “It’s me… Oscar… waiting for you in 182.2.” His retreat was a success. That night, I burned all my papers, all records… including my diary. It pained me to see that diary go. It helped me a lot. Sometimes when I was very depressed… I wrote all my feelings on its pages…. and I felt better afterwards. But orders were orders. “Burn everything” said the General (De Jesus) nervously… and so everything was burnt. I slept at Kilometer 182.2 that night, besides Ramon Pamintuan. Gatas Santos was also there. We didn’t know that later in the evening we would have a reunion. Ramon was pale and yellow… shivering with malaria. Gatas was looking fine but he was worried about his white skin. “They might take me for an American,” he said. Later in the evening, Johnny arrived. He was thin, exhausted… but not to exhausted to tell us all about his narrow escapes and the way his car ceased to be a car because of a bomb. Then Godofredo Reyes showed up. I didn’t recognize him in the dark, because I had not seen him for a long time and he had a beard. 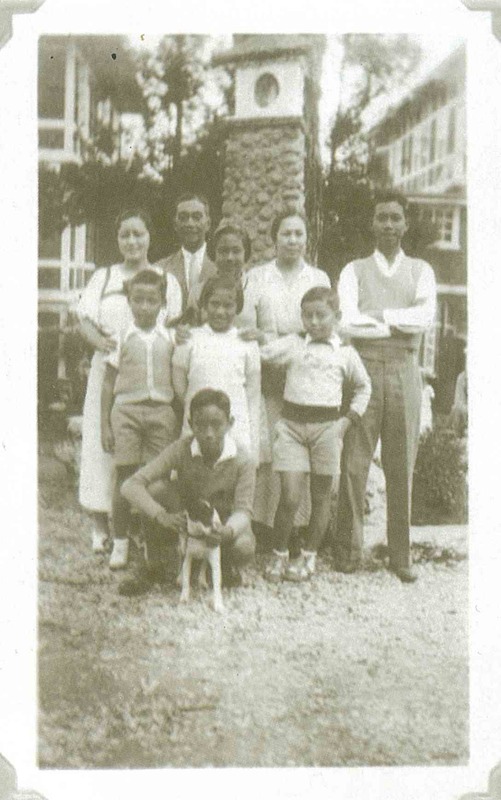 Then came Hector Unson, who I thought was isolated by Jap patrols in Batangas on Dec. 29. He said he heard I died in Corregidor. It turned out we were praying for each other’s soul. At about eleven o’clock Ernie Es. popped in. He had come from guard duty and he was cursing because it was not his turn to guard. Then Tony Nieva arrived. He was fagged out, sunburnt, and very thin. We gave him the little food we had, because he said he had not eaten for two days. He explained that his men were almost surrounded by the advance patrols of the Japanese, because the Americans ran away without notifying him. It was a reunion alright… but a sad one. 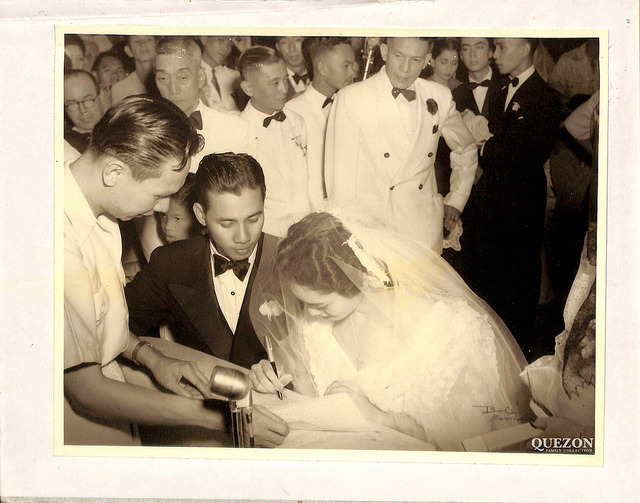 We thought we would meet each other in Manila in some victory banquet… not on the night of defeat. But as things turned out… there we were… gathering on the dry bed of a stream… not knowing what the morning had in store for us. Would the Japanese kill us? Would they imprison us? Would they free us? We were discussing those questions throughout the night, I was thinking of escaping, thru the mountains of Bagac via Zambales. But they said… ‘Let’s stick together… till the end.’ We talked of our happy days in Manila… the way we used to run around town… Jai Alai… Casa Mañana… Manila Hotel… drinking, dancing, feasting…I also thought of Nini. It was her birthday –April 9. I guess we were all changed men… and we all agreed that we didn’t regret our experience. I don’t think any of us were the worse for the hardships we endured. They had made men out of us… and above all… it put our country on the map. It was not all in vain. That’s what I was thinking of… when the ground began to shake and the stones in the stream started to roll. It was an earthquake. Was God going to rescue us in the final hour? My heart beat fast… I was sure something would happen… to turn the tide of defeat… but nothing did…and I waited and waited till I fell asleep. Attended and served Mass. Returned to Del Monte. 12:30 p.m. went with Vice-President Osmeña to Mr Crawford’s evacuation house for lunch. Returned to Del Monte. Packed my valise for the airplane trip. The planes arrived at 8:45 p.m. We could hear the roar of the engines from our house at Del Monte. At 10 p.m. we were told to get into automobiles already assigned to each person and member of the President’s party. Those that were to ride in Plane N-1 rode in cars N-1 and N-2. We were the President and his family, Dr. Trepp, Colonel Nieto, Chaplain Ortiz and myself. We arrived at the airfield at 10:40 p.m.; we were assigned to various places thus; Colonel Nieto & Chaplain Ortiz in the gunners cockpit in front. Dr. Trepp in the rear and the President, his family and myself in the radio operators compartment in the center of the plane. 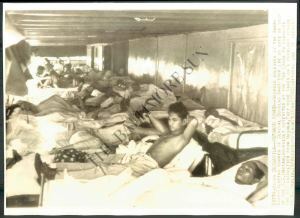 There was absolutely no comfort amenities, but we were willing to sacrifice every thing for safety. We took off exactly at 11 p.m. The moon was bright. I heard the roar of the four engines, then I felt a few bumps and a few seconds later I realized we were in the air. The first part of the journey was pleasant although I felt cold. I was sitting on a box in the bomb compartment and there was a cold draft coming from a small opening in the floor of the compartment. A few minutes later the pilot Lieutenant Falkner came and asked me not to smoke as I was situated next to the two big tanks of gasoline. I assured him that there was no danger and I was not a smoker. I could notice we were climbing as it became colder and colder. My feet were almost frozen. Suddenly I felt a hand in the dark grabbing my left leg. I got up; it was the President. “Give me oxygen”, he said “I cannot breathe well”. I applied the oxygen apparatus to his nose. After a few minutes he said: “this does not function; I can not smell the oxygen.” I informed him that oxygen had no odor and consequently could not be smelled. The he said: “Tell the pilot not to climb too high as I cannot stand it.” I took his pulse; it was a little fast due to his fear but otherwise was alright. I spoke to the pilot who assured me that he would not go higher than 9,000 feet and as soon as the enemy bases had been passed he would come down to 6,000 ft. I watched the moon playing hide and seek behind the clouds. I took my rosary and prayed fervently. I thought of my family, of my little Nucay (Charito) of those dear to me. What would become of them if the trip should end in a disaster? As the moon disappeared behind the horizon, I looked at my watch; it was 2 a.m. Then I looked at the stars, but these also disappeared as we entered clouds. The clouds become darker and thicker. Then I could hear the rain pounding on the plane. The President asked for oxygen again. Then as we entered a heavy rain squall the plane was lifted and dropped a few times by the strong winds. I did not like it. The President was quite worried. He asked me if there was any danger. I assured him that there was none. Suddenly I noticed that the pilot banked the plane and the flying became smoother, later he told us that he had gone around the squall. At 6 a.m. the pilot came to inform us that we had passed already the Japanese bases and were practically safe. I saw the sky become clearer and then the sun came out. Then I saw land and a little later Port Darwin. We landed at Batchelor’s Field at 7:45 a.m.